PRINCE Harry has today become patron of Scotland-based charity The HALO Trust’s 25th anniversary appeal in support of the pioneering charity’s commitment to getting mines out of the ground, for good. The HALO Trust clears landmines and unexploded ordnance from war-torn countries so that some of the world’s most vulnerable people can plant their crops, rebuild their homes and raise their families in safety. Prince Harry has had a long-standing connection with the charity and visited minefields in Tete province Mozambique in 2010 where he met amputees, seeing for himself the devastating impact that landmines have on some of the poorest people in mine-affected communities. During his trip to Mozambique, he spent time with a team of HALO deminers, and was shown the painstaking and disciplined process of humanitarian demining. 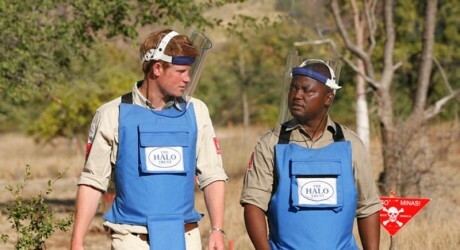 Under supervision, Prince Harry detonated several mines. The late Princess Diana visited minefields being cleared by HALO in Angola just before her death in 1997, drawing the world’s attention to the horrific legacy of landmines. Since 1988, The HALO Trust has found and destroyed more than 1.4 million landmines and more than 11 million items of large calibre ordnance (including 195,000 cluster bombs), cleared 9,800 minefields and made safe more than 433,000 acres of land. But there is still a huge job to be done, so, in its 25th year, The HALO Trust will be continuing to raise awareness to fund training, equipment and resources to get landmines out of the ground. Guy Willoughby, HALO’s CEO, said: “Many people don’t realise that wars might be over, but people are still being killed and maimed by landmines every day – there were more than 4000 victims of landmines in 2011. HALO’s press office in the USA can be contacted in Washington DC on +1 202 331 1266 and in San Francisco on +1 415 986 4852 or at press@halousa.org. The charity, founded by Guy Willoughby in Afghanistan in 1988, and incorporated in March of that year, is the world’s oldest and largest humanitarian landmine clearance organisation with one single-minded mission ‘to get mines out of the ground, for good’. As leaders in the mine action community, HALO has cleared over 12 million landmines and other explosive remnants of war. HALO employs more than 7,000 locally-recruited staff and is run from a small global HQ in rural Scotland. HALO invests in local leadership, keeping mine-affected communities integral to the process and providing employment in areas where there are few opportunities. HALO is at the forefront of development, as our work not only saves lives but is a prerequisite to any post-conflict reconstruction. HALO also runs weapons and ammunition disposal programmes which help stabilise countries that are at risk of armed conflict, destroying weapons and stockpiles of dangerous ammunition. In Afghanistan, we destroy an average of 80 tons of ammunition each month that could otherwise be used to make IEDs. HALO currently works in Afghanistan, Angola, Burma, Cambodia, Colombia, Georgia, Kosovo, Laos, Mozambique, Nagorno Karabakh, Sri Lanka, Somaliland, The West Bank and Zimbabwe. HALO is a registered charity and 96.2 per cent of income goes directly to our field operations. Pic: The HALO Trust and Fiona Willoughby. MEDIA RELEASE posted by Stripe Communications. 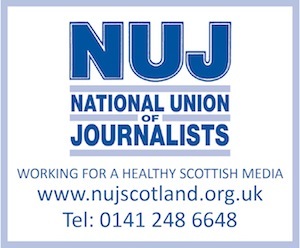 You too can post media releases (aka press releases) on allmediascotland.com. For more information, email here.